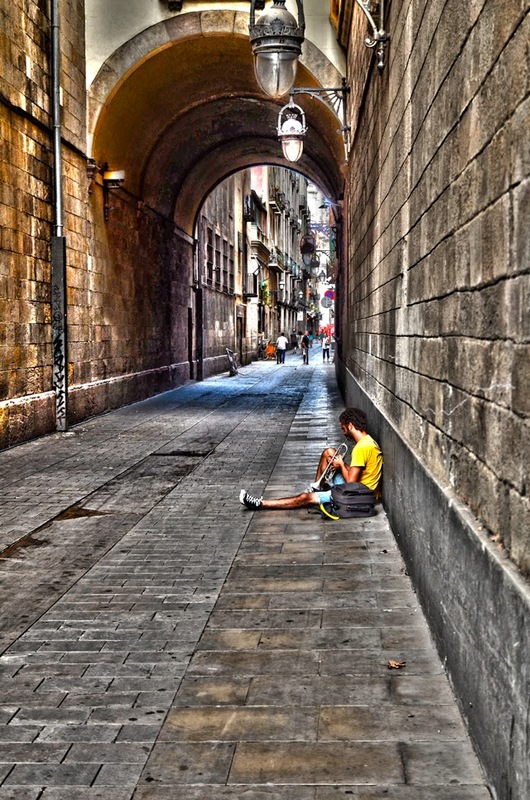 Street musicians or buskers can be found around Barcelona by the hundreds. There are some, especially in the subway that don't seem to be very qualified but all in all, you can find great intrumentalists roaming the streets. The old part of town or casc antic is no exception. The other day I spotted this wonderful young trumpeter playing his instrument at Carrer de la Merce, next to the church by the same name. The nearby archway favored the acoustics and I am sure it was not a coincidence that he was lying there. This is so wonderful, Carlos. What a sensitive view into this young man's day....and the setting is marvelous. I wish I could share this specific photograph at Facebook but when I click the Share icon it takes me to a link of your blog in general. Still dreaming of visiting Barcelona someday.